Left Hand Position Really Matters! 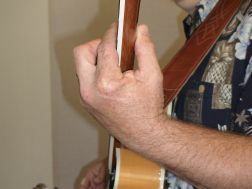 The correct left hand position can have a big effect on how easy it is to play the guitar. Everybody has a slightly different approach, but there are some general guidlines to follow. 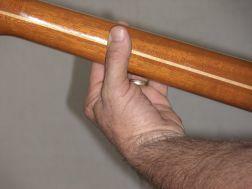 You want to place your left hand thumb on the back of the guitar neck toward the middle. The area of the thumb behind the thumbnail and down to the first joint will be the area that comes into contact with the back of the neck. Next you'll lightly pinch the neck between the thumb and the fingertips. This will cause your wrist to drop and will cause your fingers to curve so that you'll play with your fingertips. Playing with your fingertips will make it easier to get a good sound. It will also help you to smoothly move from one note to the other. There are some chords that will take your left hand out of position. That's o.k. Just remember that you want to fret with your fingertips whenever possible. The other big tip is to only use enough pressure to get a good clear clean tone. Most of us push down too hard when we're learning a new chord. This makes our hand stiff and makes it that much harder to move to the next note or chord. The best way to do it in a situation like this is to relax your hand. If you relax your hand and apply just the right amount of pressure you'll be able to play most chords or notes. That's the lowdown on good left hand position for guitarists. Keep these ideas in mind and you'll be flying over the fingerboard in no time.